I've been listening to the new Hot Chip since February or March. 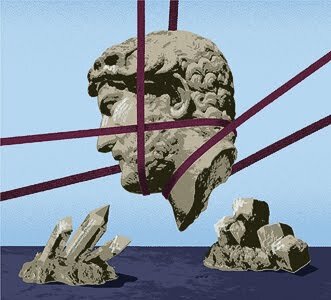 I don't know why I never got around to writing about it until now, maybe because Hot Chip's reputation precedes them, and it seemed like a band that didn't need a review from yours truly to light the ol' knowledge beacon. But I've been looking for work lately, and spending a sizable portion of my time writing on other projects, which means I have neglected the music hunt that fueled this space so greatly over the last few months. It seems like as good a time as any to discuss Hot Chip's One Life Stand, an album that rides the band's well-known electropop vibe to new blessed, choral, angelic places. And perhaps because of the band's predilection toward glitchy moments their song writing skill, creating moods out of ether and using just the right ingredients, to drive emotional/musical concepts. One Life Stand is a moody, very nearly prissy, album. It opens with the churchy organ-work of "Thieves In The Night," a song that goes from ritual to pummeling drums in a moment, and then darts into the territory of the best Erasure songs. This is brilliant dance music with soulful, poetic additives. "Hand Me Down Your Love" is my favorite track. It has marching drums, a simple piano riff, and great call and response vocals (complete with an electronic squeal-fusion) that make it an invigorating listen each and every time. And the soft, string-laden chorus draws everything back to a serious space that is completely satisfying. "I Feel Better" is an example of AutoTune applied in a context that isn't entirely torturous. The track is a slow dance number, with dusty shakers filling the gaps and synth organ that builds from verse to chorus, allowing humanity to overtake machinery, into undeniable addictiveness. The titular track is a noble and fun, complete and well-constructed, with a '80s-esque synth line that will stick in your head. "Brothers" is another Erasure-esque classic. It's a little overblown in its self-seriousness, but it's also a song the families we build for ourselves. "Slush" sits midway down the track list, and it is not the best go on the disc, mostly because of the decorative "hum a nah hum a nuh" choral whisper, and it fails in its melodrama, but, like "Brothers" it's a sappy love song that makes no apologies. The final four on the album "Alley Cats," "We Have Love," "Keep Quiet," and "Take It In" all bring the pace back up toward how the album opened, but they are all also more pronounced in their dire outlook, at least musically if not wholly lyrically. "Take It In" closes strong, and really finishes the album nicely, tying back to the poppier, higher spirited work in the first half. It also features a lead-in vocal that sounds vaguely like Billy Idol and the lyric "My heart has flown to you just like a dove," which is a seriously elegant way to assess romantic openness and peace. For its few failings, One Life Stand tries to be many things, working from a dance album to something soulful and completely unapologetic. It will take a listener through a range of emotions (not necessarily a broad one) from elated happy dancing to withdrawn happy dancing to quiet contemplation and back. If you haven't heard Hot Chip before, this is a great place to start.